It looks like the weather is going to be gorgeous in Calgary this weekend. If you’re looking for something fun to do outdoors on Sunday, you should definitely check out the World Partnership Walk at Prince’s Island Park. Taking place for over 30 years, the Walk has raised almost $90 million for international development programs and initiatives. This year, Q and his cousins have gotten together and formed a team. If you’re looking to make a donation, feel free to sponsor him here. This annual event boasts great entertainment, and of course, delicious food! 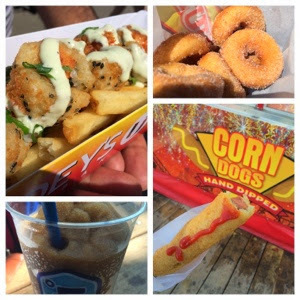 This year, there are six food vendors to fill our bellies – Africana, A Fine Balance, Bubbles & Subs, Fiasco Gelato, Waffles & Chix, Calgary Mini Donuts and Subway. It’s going to be so hard to choose! Click here to find out more information. Hope to see you there! 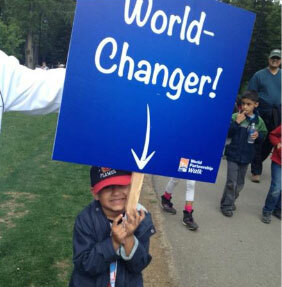 Just one week until the 30th Annual World Partnership Walk taking place on Sunday, June 8th at Prince’s Island Park! This walk is different than most with 100% of donations made going directly to fund Aga Khan Foundation Canada international development projects. No administration costs means more funding for some much needed initiatives. 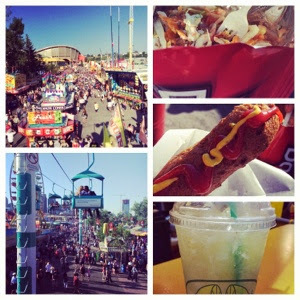 It’s always a fun day walking around Prince’s Island Park with friends and ending back at the Enmax stage to enjoy some food and entertainment. 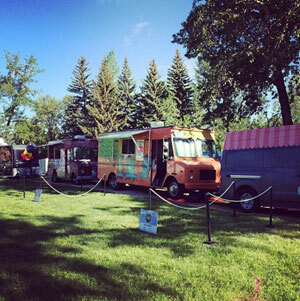 Just like last year, there is lots to choose from to fill your belly with some great vendors and food trucks. 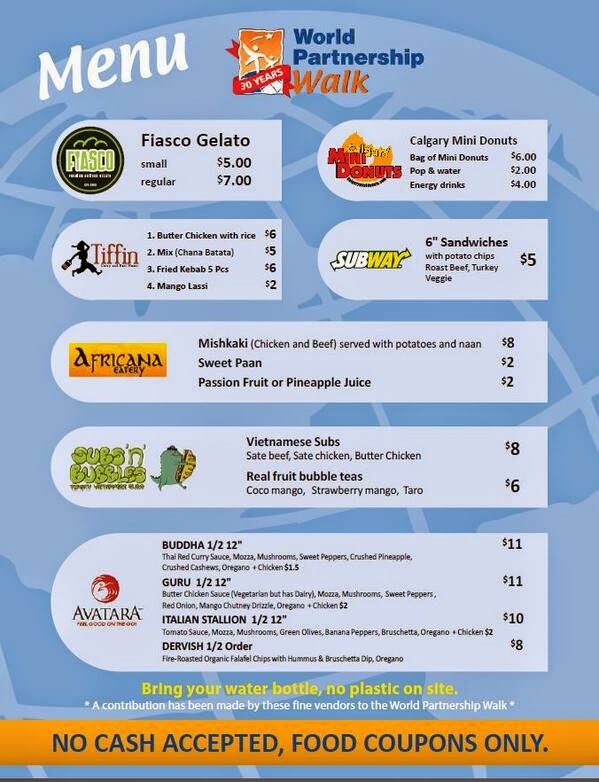 Check out the menu below! If you feel like donating, Q is raising funds and is thankful for donations to reach his goal. You can sponsor him here. Hope to see you all there! It’s Friday! What better way to kick off the long weekend than with a giveaway to one of my favourite events. 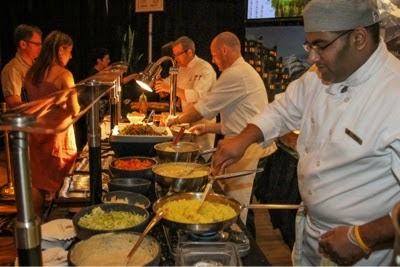 The Rocky Mountain Wine and Food Festival is taking place in beautiful Banff in May 30 and 31. At the Banff Springs Hotel, guests will be able to sample from an extensive array of wine, scotch, beer and other offerings, paired with delicious food samples. I know most people go for the libations but I love it for the amazing food options. Want to win 2 tickets to the Saturday afternoon session? Leave a comment here, on Facebook or send me a tweet as to whether you like to go for the food or for the wine. Winner will be chosen on Tuesday, May 27 in the morning. (Please note this does not include tasting coupons). The Bow Valley’s most distinctive wine and food event is celebrating another decadent weekend in the Rockies. The Banff Rocky Mountain Wine & Food Festival invites guests to sample from an extensive array of wine, scotch, beer and other offerings, paired with delicious food samples. 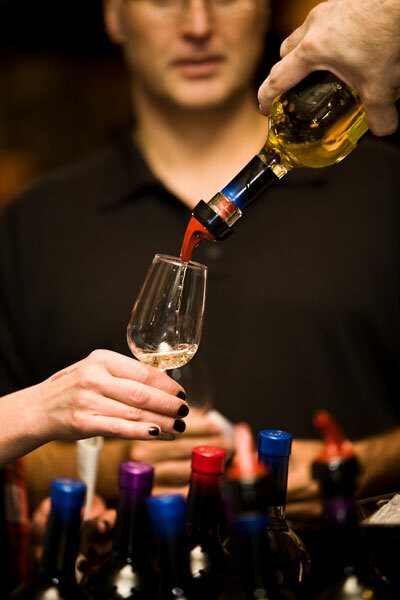 Wine and beverage experts will be on hand to impart their knowledge and provide tasting notes as attendees sip and sample their way from booth to booth. The Grand Tasting Hall will feature delectable cuisine from Banff and area restaurants and eateries including samples from The Bison Restaurant & Terrace, The Rimrock Resort Hotel, Sunshine Mountain Lodge, Balkan the Greek Restaurant, Valbella Gourmet Foods, and many more. Attendees can stay up to date on the most current event information through Twitter @RockyWineFood or Facebook www.facebook.com/Rockymountainwineandfood. 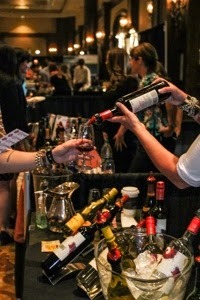 Wine, spirit and beer enthusiasts as well as food lovers will unite to indulge in tasty food and beverage discoveries. To celebrate the art of food and beverage creations brought to light by talented Banff and area restaurants, hotels and food purveyors, as well as wine, spirit and beer providers. The Festival also presents guests with an unforgettable weekend in a world-class setting. Tickets are available online at rockymountainwine.com. Sampling coupons are required for sampling and can only be purchased onsite.